Dr. William Busch is an instructor and flight surgeon at UAT. 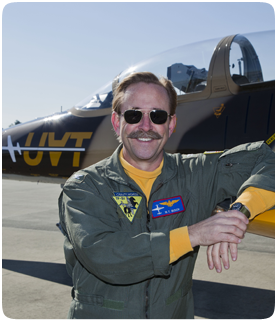 Dr. Busch retired from the U.S. Navy as a Captain and a Dual-Designated Naval Aviator-Flight Surgeon. He has accumulated more than 5,000 hours of flight time in more than 30 types of military aircraft. He is a board-certified ophthalmologist, an Airline Transport Rated Pilot and a Senior FAA Aviation Medical Examiner. Dr. Busch’s unique background and perspective have proven valuable as an aviation and aero-medical consultant. He brings to UAT physiologic insights into the aero-medical aspects of spatial disorientation. As a naval officer, Dr. Busch deployed as a pilot aboard the aircraft carrier USS FORRESTAL, flying missions in the Mediterranean Sea, Indian Ocean, Arctic Ocean, North Atlantic and Caribbean Sea. He was selected as the Atlantic Fleet Pilot of the Year. After attending medical school and earning his Navy Flight Surgeon Wings, he returned to fleet service as one of the few fully qualified Dual-Designated Naval Aviator-Flight Surgeons. In addition to his medical duties, he was an Instructor Pilot and re-qualified as a Carrier Pilot and Wing Landing Signal Officer. Dr. Busch then trained in ophthalmology and served as Department Head at the Naval Hospital Camp Lejeune and subsequently as the Department Head of Aviation Ophthalmology at the Naval Aero-Space Medical Institute in Pensacola. Dr. Busch completed his naval career as the Senior Flight Surgeon and Head of the Navy Dual-Designator Program while stationed at Naval Air Station Jacksonville, where he continued to maintain his flying qualifications as a Naval Aviator.